Feminist Theory in Diverse Productive Practices is the second of two volumes examining gender and feminist theory in Educational Philosophy and Theory. This collection explores the difference that gender and sexual identities make both to theorizing and working in education and other fields. As the articles contained in this text span nearly 40 years of scholarship related to these issues, this volume sheds light on how feminist, gender, and sexuality theory has evolved within and beyond the field of philosophy of education over time. Key themes explored in the book include women’s ways of knowing, the challenges women (and girls) face in taking up professional employment across diverse fields historically and today, and how feminist and related theories can enable women in professional development roles to empower each other. The book tells a rich story of how gender and sexuality theory has been brought to bear on discussions of educational practice in diverse fields over decades of publication of Educational Philosophy and Theory. 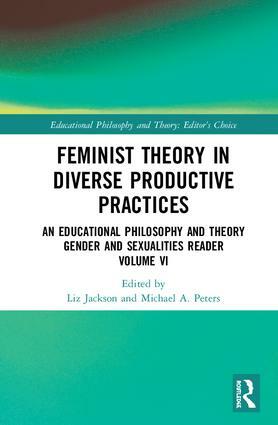 Feminist Theory in Diverse Productive Practices will be key reading for academics, researchers and postgraduate students in the fields of philosophy of education, philosophy, education, educational theory, post-structural theory, and the policy and politics of education. Liz Jackson is Associate Professor of Education at the University of Hong Kong and the Director of the Comparative Education Research Centre. Michael A. Peters is Professor of Education at the University of Waikato, New Zealand and Emeritus Professor in Educational Policy, Organization and Leadership at the University of Illinois at Urbana–Champaign. He is the executive editor of the journal Educational Philosophy and Theory. The EPAT Editor's Choice series comprises innovative and influential articles drawn from the Educational Philosophy and Theory journal archives, spanning 46 volumes, from 1969. Each volume represents a selection of important articles that respond to and focus on a particular theme, celebrating and emphasizing the heritage and history of the work, as well as the cutting edge contemporary contributions available. The series will create a rich vertical collection across five decades of seminal scholarship, contextualizing and elevating specific themes, scholars and their work. The EPAT Editor, Michael A. Peters, introduces each volume, the theme, and the work selected within that volume.